If you ever tasted a cup of good High Grown Ceylon Tea, preferably in the unblended form, you have tasted the BEST TEA there is. 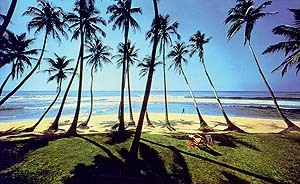 Of course, to experience that pleasure, you must go to the central hill country of Sri Lanka. And once you are there, take Route 5 from Maha Nuwara (Kandy) to Nuwara Eliya. This take you through some of the best scenery of the Hill Country. The road takes you by the shores of Mahaweli River from Peradeniya ( don't forget to visit the famous botanical gardens - remember "Bridge on the River Kwai?") to Gampola, long ago a capital of Sri Lanka. From Gampola it is a steep climb with many hairpin curves for some sixty kilometers, through spectacular scenery like this, until you get to Nuwara Eliya, the old British hill resort. To taste that heavenly cup of tea, on the way to Nuwara Eliya, look out for tea factories that advertise tea tasting. You won't forget that unique experience. 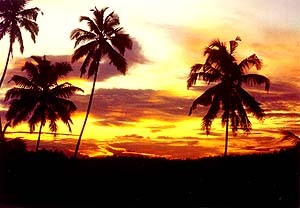 Sri Lanka has 1,340 km of sea shore, and most of it is spectacular and full of contrasts. A serene, white sandy cove, next to a craggy promontory with thundering waves beating against the granite boulders. Few miles up or down the beach, perhaps a quaint fishing village, with rugged sea going "oru," a craft akin to an oversized canoe with a history going back to Inca times, drying on the beach. If you happen to be in the area of Ahangama, or Weligama, near Matara, the southernmost city in Sri Lanka, exactly 100 miles (161 km), from Colombo, you might be in for a unique sight - the stilt fishermen of Weligama -. 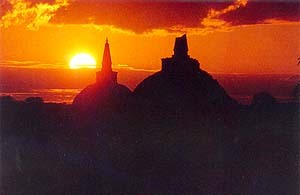 Have your cameras ready and with a full roll of film, because you won't find this anywhere else in the world. 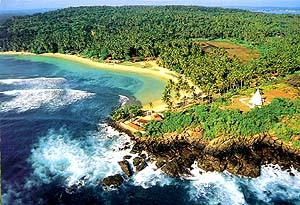 If you like to do some scuba diving, or do some quiet swimming, go past Matara to the four-mile-wide bay at Tangalla. The calm and clear water of Tangalla bay is a swimmers paradise. Perhaps you like some rougher water, to do some surfing--- not to worry, The small towns of Hikkaduwa, Totagamuwa, and Dodanduwa, in the south- west corner of the island are blessed with the ideal beaches for that sport. Frangipani or Pansal Mal (temple flowers) trees can be seen just about anywhere in Sri Lanka. They flower all year round and come in a variety of shades, from pure white to deep red, to dark purple. 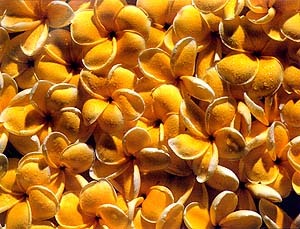 The fragrant flowers, fresh picked in bunches, are a favorite offering at Buddhist temples, thus the name "pansal mal." The color of the more abundant variety, yellow, resembles the color of the robes worn by the Buddhist monks, again making it the favorite color of the devotees. The flowers are used in making modern day fragrances, and when dried, can be used in a potpourri with other flowers and spices. In Sri Lanka and India, garlands made with fresh frangipani flowers are favorites when welcoming dignitaries to various functions. Anybody who has been to Hawaii as part of a tourist group will also recognize this as the flower used in making the Ôlei's" that welcome the visitor to that island paradise. 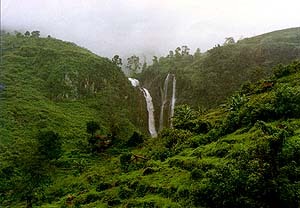 The year-round hot and humid climate of southwestern Sri Lanka, makes the ideal climate for growing some varieties of orchids, while the dry and cool climates of the central highlands make other varieties thrive, thus making the whole island, except perhaps the dry north eastern sector, one large nursery for many varieties of this exotic bloom. Originally started as a hobby by the "idle rich," growing orchids, now is a money making hobby for anybody with a green thumb. As the world demand for exotic flowers gets more intense, Sri Lanka seems to be in an enviable position to supply that demand, and earn some badly needed foreign exchange too. 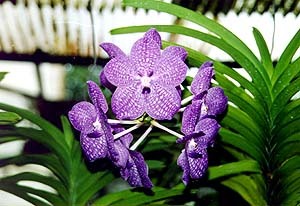 Shown here are some of the more common "every day" varieties of orchid. Since many orchid varieties lack alluring scents to attract life-giving bees and other insects to aid in pollination, they depend on their profusion of colors to lure these insects. Thus, in good nursery one can find orchids of just about any color of the rainbow. 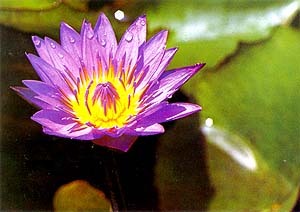 This, the "Nil Mahanel," botanical name "Nympheae Stelleta," has been the national flower of Sri Lanka from 1986. This flower mentioned in many Sinhala, Pali and Sanskrit literary works, occupies a pre-eminent position in Buddhist literature. Legend also, has it that the 'Nil Mahanel Flower' is among the many ceremonial designs found on the footprint of Prince Siddhartha, giving it a special significance among the many devotees of Lord Buddha. This flower in the hands of the exotic ladies immortalized in Sigiriya Frescoes, enhance their ethereal beauty, and poets have always likened women's eyes to the unopened Nil Mahanel flower. 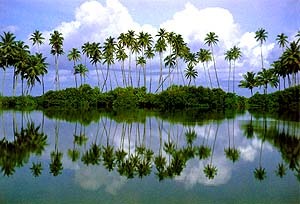 The Nil Mahanel plant grows in shallow, warm waters, and is found in all parts of the country. It is specially plentiful in the northern dry zone and as a result, this flower is a favorite among the Buddhist devotees as an offering at the many temples and "dagobas" in and around the ruined cities in that area. The flower which is purplish blue in color has a heavy concentration of petals in the center. The Nil Mahanel flower is also considered a symbol of truth, purity and discipline. A clear cool morning in the valley, everywhere eyes can see, lush, green, vegetation, birds singing their heart out --- perhaps Tchaikovsky spent a night here before writing his famous symphony. 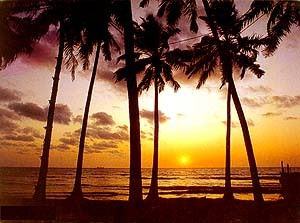 In Sri Lanka we have a special branch of poetry, "pal kavi" (poems of a cottage), inspired by scenes like these. These poems keep the farmers, who spend the night at temporary huts like these to protect the crop from marauding animals, awake and entertained. It is not uncommon to hear "poetry contests" that sometimes run all night, between farmers in adjoining farms. 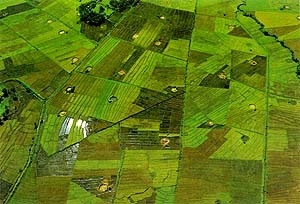 These huts have a bamboo frame, covered with woven coconut fronds. This allows for good air circulation to beat the mid day heat, yet provide ample protection from the monsoon rain that keep the vegetation lush and green. 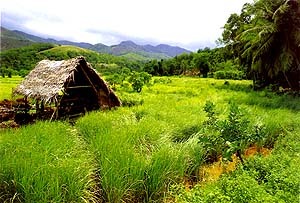 These huts also are used during the growing season, for resting between bouts of work, and serve as a convenient place to enjoy the meals brought to the field by the women folk of the village.